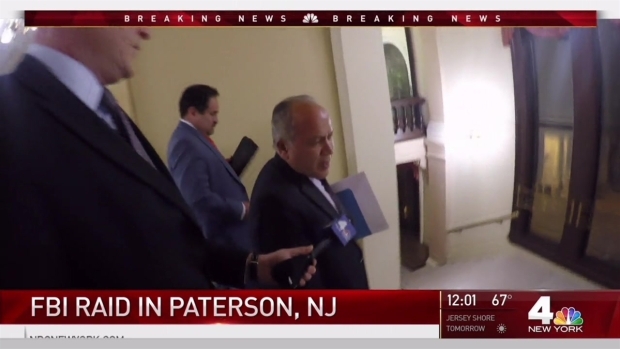 Federal agents executed search warrants at the offices of the economic and community development departments in Paterson, New Jersey, Thursday in connection with a federal corruption investigation, law enforcement sources familiar with the case tell NBC 4 New York. FBI agents were seen carrying boxes out of city offices at about 11 a.m. The corruption investigation is looking into how the city used federal housing and urban development funding, NBC 4 New York has learned. Thursday's search is focusing on the money trail and whether crimes were committed in the way city officials handled federal assistance. No arrests were made in connection with the case Thursday. Federal agents executed search warrants at the offices of the economic and community development departments in Paterson, New Jersey, Thursday in connection with a federal corruption investigation, law enforcement sources familiar with the case tell NBC 4 New York. Jonathan Dienst reports. The city's attorney said in a statement to NBC 4 New York: "We are confident that the federal officials will be satisfied with the City of Paterson's adherence to any and all federal regulations." The federal probe comes as the office of New Jersey's state attorney general is conducting its own criminal investigation into Paterson Mayor Joey Torres and the Democrat's alleged use of city Department of Public Works employees for personal business on taxpayers' dime. The I-Team has documented about a dozen instances where city workers were billing taxpayers for private work at the mayor's home and a business belonging to one of his relatives. The mayor has denied any wrongdoing. The findings included video shot by a private investigator that showed city employeees washing a scooter, building bookshelves and doing construction for his nephew's would-be beer business. City councilman Andre Sayegh, a political rival to Torres, said Thursday that the FBI raid raises additional questions. "This shows a pattern of misuse of municipal resources, but now the whole issue of misappropriation of federal funds has come into play as well," he said.